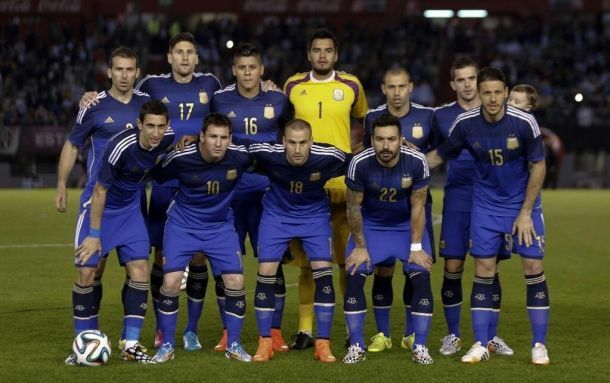 Goals from Mascherano, Palacio and Maxi saw Argentina defeat a poor Trinidad and Tobago side, 3-0. Argentina easily beat Trinidad and Tobago last night, in a 3-0 demolition job, that saw one of the favourites for this Summers World Cup continue their fine form ahead of their first competitive match in the tournament. A close to full strength side showcased some strong individuality as well as strong team bond to overcome Trinidad in the Estadio Monumental in Buenos Aires. Goals from Rodrigo Palacio, Javier Mascherano and Maxi Rodriguez secured a comfortable victory. The Argentinian faithful will be pleased, not just at the result, but the level of performance too, with Messi and team mates being in full control of the game for the full 90 minutes, with Trinidad striker Jones, rarely getting a feel for the ball, being isolated up front on his own. Alejandro Sabella's side were in possession of the ball for much of the first half, but struggled for that final pass in the final third. Soon Palacio netted and the killing instinctive that Alejandro Sabella's men initially lacked, looked to have returned to his men. Palcio's goal came from an in-swinging corner from Real Madrid star, Di Maria, which was nodded on towards the goal, only for the Trinidad keeper, Williams, to let the ball slip into his own net. The lead was soon doubled after the half time break, when Messi struck a sublime costless kick, which cannoned off the post, only for his Barcelona team mate, Mascherano, to tap the rebound in. The game was soon wrapped up with Maxi Rodriguez getting his name on the score sheet, Mascherano found an on running Palacio, who stepped past, Williams, in the goal of Trinidad, at a tough angle, Palcio, slipped in Maxi Rodriguez, with the former Liverpool fan favourite striking from 10 yards to secure a vital win, in terms of momentum.